How did you find your Wildhood in 2017? We’ve marvelled at all the stellar adventures and RV road trips you’ve embarked on this year, in celebration of #Canada150! Thank you for sharing your RVing stories and a glimpse into how you #BringBackWildhood! What better way to cap-off another amazing year in the great outdoors than a roundup of some of your photographic gems. From the Badlands to the fjords, the prairies to the peaks, it’s pretty incredible to follow your Wildhood moments! For a little travel inspiration, check out our Top 8 Picks from fellow adventurers in the Go RVing Canada community. Happy holidays and happy travels! Visit the The Wildhood Stories and start daydreaming about your upcoming adventures in 2018! “Wake up, jump in lake, cozy up to coffee inside the camper, repeat…” Take note of these words of wisdom from our friend Anne McIsaac (@yellowillow). You’ll find your happy place in no time. Embarking on a cross-country road trip is just the ticket for inspiration and that renewed spark of creativity. And that’s exactly what travel photographer Zach Baranowski did earlier this year. Here’s a breathtaking shot from his visit to the awe-inspiring Badlands in Alberta. Read more about Zach’s pursuit to capture Canada’s beauty one adventure at a time. That moment when you’re in the right place at just the right time. Our Aussie friends Owen Milne and Andrew Mooney took a motorhome on the road for the ultimate surfing/RV trip with their Canadian surf buddies in Eastern Canada! See the swell highlights in this epic video and stay tuned for more Wildhood Stories coming soon! Fascinated with the idea of living on the road full-time? 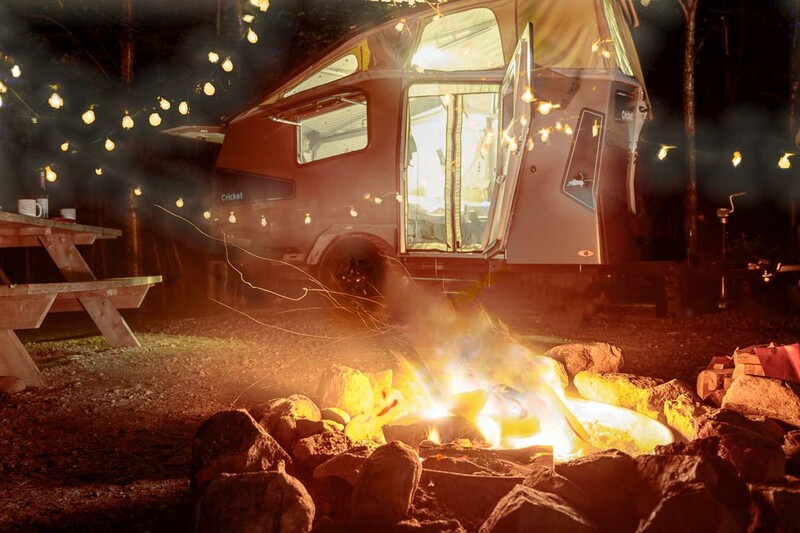 Digital nomad Stephanie Foden was so intrigued by the RV lifestyle that she jumped in her 1987 Class C motorhome and set out on an incredible photo documentary project called RV Diaries. Read more about Stephanie’s cross-country adventureson our blog. Love the idea of roaming free, eating from a stick and digging your toes in the sand? We couldn’t agree more. Karen at Oh My Inspired was so moved by our Bring Back Wildhood commercials that she put her paintbrushes to work and created this gorgeous watercolour painting – with dreams of stargazing in the woods with her family someday. Don’t you love it when you find the perfect place to park and the stars align? It’s a pretty spectacular feeling, isn’t it? Canadian photographer Neil Zeller captured this feeling beautifully at a campsite in the prairies, with the celestial glow of the Aurora Borealis to light up the night sky. Sun-kissed, snow-kissed, rain-kissed. Whichever mood Mother Nature seems to be in, the dashboard view on the road is a pretty beautiful thing. 9. It’s the simple things. This photo pretty much sums up the joys of RV living: the simple pleasures of drying fresh laundry on the clothesline, gazing at a brilliant sunset and nestling in a cozy nook with a cup of tea. Living the dream! We’d love to see where your RV adventures take you in 2018 – tag #BringBackWildhood for a chance to be featured on our blog or our social media community. Feeling inspired to map out your next road trip in the new year? Get started with our handy RV Trip Planner.